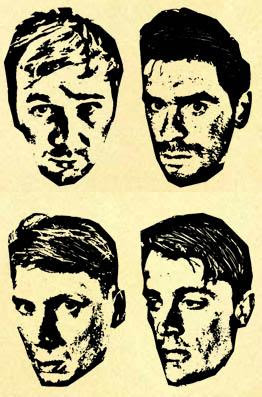 ::: Off the Radar :::: FRANZ FERDINAND RETURN IN 2009!! FRANZ FERDINAND RETURN IN 2009!! Can't wait for the arrival of Franz Ferdinand's Highly Anticipated 3rd Album TONIGHT which will be released January the 26th in the UK and the 27th here in the U.S.! That first self titled album that they put out back in 2004 was my absolute favorite! I couldn't stop playing that record for months. I had to have been one of their biggest fans. It spawned many hits starting with the classic high flying anthem 'Take Me Out' which still works to this day as well as providing the upswing for the 'Indie Rock' movement that took over for a couple years there, along with contemporaries The Killers, Modest Mouse, Interpol etc. You all remember those don't you? They went on to release their second album 'You Could Have it So Much Better' the following year in 2005. It was more of a guitar record and although possibly technically better than their first, it didn't quite have that raw dance energy their debut had. Three years on and 'Tonight' is upon us. The bands been saying this new record is alot more drug and dancefloor friendly than 'You Could Have It' and more similar to that first disc's energy and dancier grooves. If the first single in any indication they may be right. 'Ulysses' has lead singer Alex eniticng you to 'Let's Get High' and how wild that last night and how you're never going home, so that assessment may be right. Can't wait to hear the whole thing! In the mean time here's first single 'Ulysses' plus my favorite remix for it so far by Herr Kaschke. I Miss My Juno did a pretty impressive remix also that can be found on Hype Machine. They released stems from Ulysess earlier last month for remixers, so we should be getting plenty different interpretations of Ulysses in the coming months.